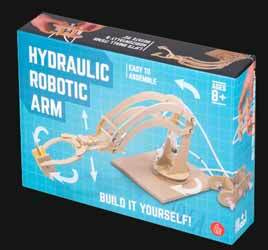 For those with an interest in robotics, hydraulics or wanting to broaden the mind of their children, the Hydraulic Robotic Arm is an educational toy that will provide hours of fun. As a starting point of how hydraulic robots work, this contains everything you need to fire the imagination of a young mind. However, I wouldn't advise giving this to a young child without adult supervision. The front of the box states that this is "easy to assemble", but on opening the box I discovered that it was the equivalent of robotic flat pack furniture. But, if you want to know how the basic principals behind hydraulics actually work, what better way than to construct a working model from the ground up. This way you can appreciate how each component works. The instruction manual is also worth commenting on. 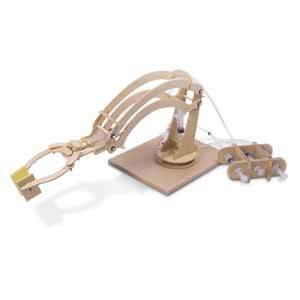 It's been written by someone with a keen sense of humour, designed at the young engineer. And everything is included in the kit to get you started. Once you begin putting it together, it really isn't that difficult. In addition, if you're doing this with a young family member, it'll help create a stronger family bond.